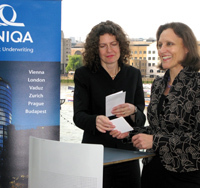 The art insurance arm of the UNIQA Group has long enjoyed international success in Prague, Budapest, Zurich, Vaduz and Mannheim, in addition to its home city of Vienna. A further branch opened a few days ago in London in the Lloyd\´s Building – the world-famous insurance centre. UNIQA and its expertise are therefore now represented at one of the absolute hot spots on the international art scene. UNIQA can draw on many years of experience and tradition in the field of art insurance. Extensive international expertise has been amassed over the past 20 years and the range of activities continuously expanded. Today, UNIQA offers private customers and institutions a wide range of art insurance products and is the market leader in this specialist area in Central Europe. In addition to around 3,000 private customers, insurance is provided above all for world-famous Austrian museums, such as the Albertina, the Museum of Fine Arts, the Austrian Belvedere Gallery, the Museum of Modern Art, the Joanneum in Graz, the Lentos in Linz and a number of other renowned national museums in the art world. Internationally, 25 employees based in Vienna, Prague, Budapest, Vaduz, Zurich, Mannheim and most recently in London look after the National Gallery in Prague, the Museum of Visual Arts in Budapest and numerous other museums in Switzerland, Liechtenstein and Germany, as well as many galleries, dealers and private collectors. The focal point in all of this is not only on providing insurance for exhibition projects, but also for international loans. For UNIQA, the opening of a branch in London, one of the hot spots on the international art scene, was the logical next step in the development of its art insurance activities. “This new location puts us closer to existing local customers and also successfully continues our strategy, with which we successfully developed our market positioning Central Europe, at international level,” says Dr. Johannes Hajek, CEO of UNIQA Property Insurance. UNIQA can draw on around 20 years of experience in the field of art insurance: the art insurance expertise accrued by the former Nordstern Verischerung – one of the predecessor companies of UNIQA – formed the basis of today’s market leadership. Within the past few years, UNIQA has made a name for itself on the Continental art insurance market by providing innovative products that are tailor-made to the needs of a wide range of art collections and cultural institutions. UNIQA offers not only comprehensive and fast insurance cover (e.g. for short-term exhibition projects), but also competent advice and support. The services include all-risk cover, nail-to-nail insurance protection as well as security advice by international experts. An agreed value, fast service in case of an incident and the reporting of stolen objects to the Art Loss Register are just some of the additional services provided by UNIQA Art Insurance. The product “Art & Passion” is enabling increasing numbers of private customers to participate in the far-reaching experience amassed by UNIQA in the institutional sector. These customers have the opportunity to insure valuable art items (whether paintings, furniture, sculptures, glass, silver, porcelain, photographs or collectibles). The unique feature of this product is that the art objects to be insured are valued solely by art historians, in their role as accepted insurance specialists, in conjunction with the customer. This allows the market value to be determined before any loss event occurs. In addition, they support the insured party with professional advice on the collection or the individual art objects. "Ignorance is a keyword with regard to the destruction of art "“ writes Dario Gamboni in his book, "Destroyed Art".1 The destroyer knows neither the value of what he is destroying, nor is he in a position to properly estimate the significance of what he is doing. At the beginning of the 19th century, Francisco de Goya clarified this in a brush drawing entitled "He knows not what he does": it shows a man balancing with tightly closed eyes on a ladder and holding a pick in his right hand, which he has just used to knock a sculpture off its pedestal. The "barbarian" is often fully aware of the value of the art - whether ideal, symbolic or even material - and probably knows exactly what he is doing: he wants to destroy social conventions and traditions. Of course, Goya’s drawing needs to be understood in the context of the political upheavals and radical shift in values of the French Revolution. It is hard to draw the line between (originally) religiously, politically or socially motivated “iconoclasm” and the mindless “vandalism” characterised by a lust for destruction. A prominent example of this is the attack on Barnett Newman\´s painting "Who\´s Afraid of Red, Yellow and Blue IV" at West Berlin\´s New National Gallery in 1982: a 29-year-old student entered the museum by the back door, took one of the plastic barriers which had been set up to protect the painting from being approached by visitors and used it to smash the artwork. The picture, painted by Newman in 1970, the year of his death, had shortly before been purchased from his widow for what at the time was the “astronomical” sum of 2.7 million deutschmarks. To raise this amount of money, the director of the New National Gallery organised a “Homage to Barnett Newman”: twenty-six notable German artists donated works, whose sale made a substantial contribution to the financing of the purchase. Just as great was the media attention and just as heated the public debate surrounding the value of the painting and the value of contemporary art. The perpetrator, who had a simple social background and who left at the scene, a notebook of housekeeping accounts for his shared student accommodation as evidence of his difficult financial situation, justified the attack by saying “that money was responsible” and that “the value system was somehow completely upside down”. For him, the painting was the “definition of this whole mess”. Barnett Newman\´s “Who\´s Afraid of Red, Yellow and Blue” may have had an equally magnetic power of attraction over perpetrators. Four years later, in 1986, Version III from 1967/68 was badly damaged in a knife attack in the Stedelijk Museum Amsterdam; the perpetrator declared his act to be an “ode” to a Dutch “magic realist”, a vehement critic of abstract art. Following his release from prison in 1997, the perpetrator once again tried to destroy the painting. Because it was no longer on exhibit – probably due to the huge international reaction to the “scandalous” methods of its restoration – he instead sliced through Newman\´s “Cathedra”. Apart from iconoclasm and vandalism, the problem of damaged or destroyed art is often much more complex, if also less spectacular. The lifespan of each artwork depends on various factors: on the materials, their quality and combination, on environmental conditions and their effect on the ageing process, as well as on use and/or wear. Not least, careful handling and forward-thinking action in matters of conservation form the framework for the “survival” of art. The last two points in particular are increasingly relevant in today\´s exhibitions: damage caused by transport and/or handling (packing, unpacking, hanging) accounts for more than half of all cases - internationally, about 60%. In my day-to-day work, I occasionally have to deal with another aspect: each instance of damage to a work means an intervention in its artistic original substance. A good restorer will try to reduce or even eliminate the consequences and symptoms - however, the intervention in the original substance remains, which reduces the theoretical and material value of the artwork. By way of illustration: the costs for the – perfect – restoration of the Roy Lichenstein\´s painting, “Nudes in Mirror”, which was damaged in a knife attack at the Kunsthaus Bregenz in 2005, came to ten thousand euro, and the insurance company was additionally faced with claims for a reduction in value running into the millions. Some artists also consider the damage caused to one of their works as an event to be understood in artistic terms. Sigmar Polke’s “Gangster” (1988) from the Reiner Speck collection – a painting measuring 300 x 230 cm – suffered a tear in the base fabric. Instead of grappling with the possibilities of restoration, the artist had a photograph taken, which shows him reaching his hand through the tear to the collector, Reiner Speck. By doing this, Sigmar Polke is showing us that his picture has lost none of its validity – and probably nothing of its value either – as a result of the damage. How and why should I insure my collection? When men wearing black masks stormed into the Munch Museum in Oslo in August 2009 and made off with two paintings by famous Norwegian painter, Edvard Munch, “The Scream” and “Madonna”, the art world bemoaned the loss of an icon of art history. The shock became even greater the next day, when it was announced that the “Scream”, painted in 1893, was insufficiently insured: the Munch Museum had only insured its art treasures against fire and water damage. The opinion that it would not be possible to replace the original in the case of total loss, for example, by theft, had prevented appropriate cover from being put in place. This event made it common knowledge to the general public that many museums and private collectors are inadequately insured: on the one hand, they believe that they cannot afford the premiums for the occasionally very high insured sums and on the other, they assume that “nothing will happen” and can consequently do without appropriate insurance to protect their assets. Art and antiquities have been the targets of professional thieves for as long as their value has been anchored in the general consciousness. Although we are happy to imagine an art thief as an enchanting charmer and art connoisseur, as depicted in the 1968 film “The Thomas Crown Affair” and its 1999 remake, or as one of the characters driven by a passion for art, as Stéphane Breitwieser aims to convey to us in his autobiographical “Confessions of an Art Thief”, the reality of art theft or art robbery is a serious global problem. So serious, that the London-based Art Loss Register was set up in 1991 by various affected parties, such as international auction houses, police authorities and insurance companies, in order to facilitate the reacquisition of stolen art and thereby to prevent it from being traded on the open market. It is interesting to note that according to one statistic published by the Art Loss Register, the majority of thefts – contrary to expectations – do not take place in museums and galleries (each at 12%) or church facilities (10%), but predominantly in private households (54%). However, the cover offered by conventional household products for the insurance of art collections is in most instances insufficient. A single insured sum is defined based on the size of the home and includes the entire contents – including often highly valuable art and antiquities; the fact that most policies have a maximum limit for valuables and that, from experience, the corresponding sums are far from adequate, is still not taken into account. Not to mention the fact that in the event of a loss, there are insurance experts with the relevant know-how who can assist with reacquisition following a theft, or who are able to initiate the professional restoration of a damaged artwork. So what should an art collector consider? Above all, he should try to assess the various risks in order to be certain that the objects in his collection are insured against every risk that could result in damage or total loss. For a porcelain or glass collection, attention must be paid to ensuring that breakage and damage are also insured. If a collector travels the world, for example to acquire his sought-after objects at international auctions, insurance cover should be chosen that automatically activates at the time of acquisition and also includes the corresponding transport risk. If the art collection is located at various addresses, the freedom to move artworks between the individual locations should be agreed. A special art insurance policy therefore also covers all risks, with the exception of a few that are explicitly defined as exclusions: for example, the natural ageing of an artwork, signs of wear through daily use, or damage caused by incorrect presentation (such as colour changes in watercolours or photographs exposed to direct sunlight, as well as damage to paintings which are hung directly above a working, open fireplace). In reverse, this means that all risks which could suddenly and unpredictably damage or destroy an artwork must be insured against (e.g. fire, water, natural disasters, theft, robbery, damage or vandalism). Once adequate insurance cover has been found, how does one proceed to establish and determine the value of the objects? It is important to select a policy with “agreed values” in order to avoid any discussion about the value of a collection in case of a loss. This makes the market value or current value as a basis for compensation or any under or over-insurance obsolete. Extensive museum collections can also be well protected with a so-called insurance for “first risk”. This involves selecting an insured sum that is in reasonable relationship to the total value and the highest individual values, and represents the maximum amount that the insurer will pay out. This makes insurance affordable, even in cases of an enormous concentration of value: most losses, whether through damage or theft, generally do not involve the entire collection, but only a part of it or an individual item. This principle also offers a feasible option for high-value private collections, because in the worst-case scenario, it is still always better to receive partial compensation than to have to carry the entire loss oneself. The “near disaster” of the early summer this year has (again) turned conservation-related requirements for dealing with paper-based artworks into a publicly debated topic – making it a good idea to add a few comments to this discussion that may be of interest to art collectors. Between an overpainted collage of newspaper clippings by Franz West and a landscape etching by Rembrandt lies a very broad range of “works on paper”. Despite this, I will try to formulate here a few generally valid principles regarding presentation and storage. Paper of the 16th, 17th and 18th centuries was, with its complex manual production process, a refined, expensive and – viewed through the eyes of the restorer – a very robust product. The “fall to sin” from a conservation perspective began with industrial mass production at the beginning of the 19th century, with the admixture of wood pulp: paper became an inexpensive material with an expiry date. Handmade paper for “artistic” needs continued to be offered, but many artists of the (early) 20th century opted for “cheap” materials, such as writing and packing paper or newsprint, or wood-containing cardboards – normally out of financial necessity or out of a conscious attitude of denial – and thus created works that can entirely be thought of as “conservation time bombs”. Only in recent decades has more attention been paid again to the aspects of shelf-life and stability in the production of paper, in view of crumbling newspaper archives and decaying libraries. A traditionally carefree approach to matters of conservation and restoration was nurtured for centuries, particularly in the area of old master prints; favoured by truly simply to use processes and the fact that traditionally created handmade paper– at least in the short term and superficially – forgives certain sins, was washed and bleached, repaired and pressed. More or less qualified persons, such as bookbinders and passionate collectors, felt called upon to act as experts or to write instruction books “on the cleaning, bleaching, raising and framing of copper engravings”. Retaining the original substance of an artwork or its natural ageing was not an issue. Not only today’s visible, negative consequences of this approach, but also a change in conscience regarding the inner history of a work of art, led to a general paradigm shift in the fundamental questions of restoration – the focus now is on retaining the historic artistic substance. What harmful effects must be avoided with paper-based works? Firstly, direct or indirect sunlight, or artificial light sources with a high proportion of short-wave radiation; we prefer muted lighting, which creates a characteristically “intimate” atmosphere for the presentation of graphic works in museums. Light not only bleaches out many colours, but also promotes various chemical processes that break down the paper fibres. Yellowing and browning are the immediate consequences. Just as important is protection against high air humidity and strong temperature fluctuations, which always lead to sharp fluctuations in humidity, and against direct wetness, of course. The cellulose fibres in the paper swell with water; rippled, distorted or warped sheets are the sometimes irreparable outcome, and water-soluble colours begin to “bleed”. In addition, damp paper is an excellent breeding ground for various micro-organisms: foxing and mould spots occur, while the acids released can further damage the paper fibres. For this reason, direct contact must be avoided between the sheet and acidic or acid-forming materials, such as non-buffered papers and cardboards containing wood pulp, wood, leather and some artificial resin surfaces. Not to be neglected either, of course, is the choice of suitable adhesive for all mounting and repair work; the use of conventional adhesive tapes is a deadly sin on valuable artworks – and on books, too. The traditional methods of collecting etchings, engravings and old master drawings was the bound (adhesive) album or (portfolio) cassette. In case of doubt, I would nowadays prefer many fragile works on paper – protected by a passepartout made from archive-proof material – to be stored in cassettes in a permanent “on the wall” presentation. If you opt for permanent hanging (in an indirectly illuminated location, of course), then a certain amount of protection can be provided by glazing the frame with a special UV protective glass or UV-impermeable acrylic glass, as well as by using a frame construction that creates a stable microclimate. For these issues and activities, I recommend consulting a qualified expert, who will most likely be able to combine aesthetic aspects with the consideration of conservation principles. In supporting collectors, who like to live within their own four walls surrounded by their works of art, I am constantly confronted by the prejudice that a conservationally correct presentation can only be achieved in a museum. In fact, much can be achieved with relatively little financial outlay and without heavy spending on technology for primary requirements such as temperature, air humidity and the stress caused by light; only a few simple, but entirely important, principles have to be followed. With regard to temperature, it is not so much the absolute value that has to be considered (and which is hardly extreme in the home), but rather, the fluctuations and temperature gradients that an artwork has to “process”. Naturally, different materials react to this in different ways. In the case of “classic” paintings (especially those on a sensitive medium such as wood), mixed media works and photography, temperature-related damage can be a serious problem, while other aspects are problematic for works on paper. The difference between air and wall temperature is often considerable, especially where outside walls are poorly insulated. A picture hanging on a wall creates a temperature gradient between the back and front of the picture carrier: stresses, cracks, paint flaking and an accelerated ageing process are possible consequences. Hanging a picture directly above a heat source – even by a lamp – poses the same risk. Careful placing of the works, taking aesthetic and conservation perspectives into account, helps to avoid this. With framed pictures, the insulating effect of an air buffer between the wall and rear of an appropriately constructed frame is also helpful and should not be neglected. Stresses, cracks, warping, ripples – in extreme cases the formation of foxing and mould spots or mould growth – are the result of problems with (air) humidity. They can occur anywhere that materials swell due to water absorption or shrink due to water release: in paper, cardboard, wood and the gelatine in a photographic emulsion. Apart from the weather and temperature-related fluctuations of air humidity, other causes of problems include poorly insulated walls and, more frequently, the dampness left behind after renovation work or water damage. A simple recipe in such case is a little patience: wait a few weeks after completing the renovations, or use a dehumidifier. The way a picture is framed, if it follows the principles of conservation, can again make a decisive contribution to reducing harmful effects. Of great importance, especially for works on paper and for photography, is a frame construction and approaches which stabilise the microclimate and a mounting method which absorbs tension, lets the material “work” and avoids direct contact between the surface of the painting and any glazing. At this point, it seems entirely fitting to make reference to some other aspects of “art-appropriate” framing: the exclusive use of non-harmful, acid-free materials of “museum quality” for passepartouts and image carriers, the use of suitable adhesives and consideration of the principle of reversibility for all mounting work. All of this belongs in the hands of a qualified expert, a (paper) restorer or a specialised framing studio. Opting for a cheap product in a “do-it-yourself” approach may seem quite attractive, but is certainly not a strategy for taking the strain off his collection budget. Works on paper, as well as photography and new picture processes, face another particular conservation problem: damage caused by light. The reason for this is the low resistance of watercolours or felt tip pens, colour photographs or inkjet prints to direct sunlight and other sources of light with a high proportion of UV light. Light facilitates and accelerates various chemical processes that break down paper fibres – a virulent problem, especially in lower-quality papers which were often used in the art of the 20th century. As photochemical reactions generally play an important role in the ageing of plastics, a certain amount of caution should be taken with products made from modern technologies such as Diasec or Irisprint. The best preventive strategy for dealing with sunlight is to avoid direct exposure by hanging the work in a suitable place. If the shape of the artwork allows, suitable protective glazing offers additional security. A framing specialist can advise you on various types of UV-absorbing glass, and I would once again like to draw your attention to the importance of professional and expert framing for the safe presentation of your artworks. The fact that museums hardly ever exhibit their sensitive works on a permanent basis, but allow them to rest for extended periods in an air-conditioned depository, can also be taken as an example for dealing with art carefully within one’s own four walls. Information on the topic of “Security” will round off this area in the next volume. An episode from my everyday life as an art insurance expert: I was asked to take on and “bring home” insured art objects originating from a series of burglaries in Vienna. So I sit in my hotel room in the capital city of one of the EU’s new Member States and scan the few documents available one last time in preparation for the handover formalities: fragmented inventories, poor reproductions of poor photographs, some copies of official documents. The details on the most prominent piece, a painting by an Austrian Biedermeier painter, whose insured value reflects the value of the artist, is largely limited to the number in the catalogue of works – described as the first of two handwritten variations, as indicated by some brief research. Overall, there is some information available, yet far too little to unambiguously identify works of art which one has never seen in one’s life. A situation like this clearly shows the importance of a uniform and binding object description for works of art. However, missing, imprecise or erratic information is an obstacle that is difficult to overcome, not only in the targeted search for “lost” or stolen art. Hence, apart from a few spectacular cases with high media interest, the return of art looted by the National Socialists to its lawful owners becomes a “puzzle” due to the lack of corresponding documentation, which can only be solved with perseverance, criminal flair and intensive archive research. To dispel any doubt and obscurities caused by different, mostly absent guidelines on the documentation of artworks and cultural items, the J. Paul Getty Trust launched an initiative in 1997 to create international, binding standards for their description: the object ID. With the involvement of Interpol, museums and cultural institutions based on the International Council of Museums (ICOM), the art trade, auction houses and insurance companies, this project has been continued since 1999 by the Council for the Prevention of Art Theft and propagated by UNESCO “as the international standard for recording minimal data on movable cultural property”. So what should the documentation of an art object look like according to the object ID? Logically, it always concerns a combination of photographic documentation and “classic” description. Apart from photographs and detailed photographs of the object – where possible, with sizes and a colour reference – clear and unambiguous information on the following points should be provided: nature of the object, material and technique, dimensions, descriptions and/or signatures, as well as “special features”, including damage and restoration. In addition, an attempt should be made to describe the object verbally, e.g. with the nature and topic of an illustration, it should be dated where possible or assigned to a specific period and include any available title and – if known – the name of the artist. Two important points must also be considered when documenting art objects: the data used to identify the objects in a collection must be safely kept and regularly updated. The table provided by the “Object ID” checklist should be populated with the most detailed information possible, but should be seen as a minimum requirement. It is also important for the information to be unambiguous: it should include – certainly with respect to the Anglo-Saxon world – details on size and/or weight as well as the unit of measurement and strict observance of the format “height by width by depth”. The fact that painting dimensions are generally determined and indicated without the frame is an international standard, but remains a frequent source of misunderstandings. It is also worthwhile paying attention to the back of panel paintings or graphics. Sometimes, time leaves its mark here, which can be used to reconstruct the individual biography and provenance of an artwork: collector’s stamp, ownership details and inventory numbers, exhibition slip and old attributions, information on auctions as well as seller notations, lot numbers and other details. The “Recollecting” exhibition at the MAK showed how informative a peek “behind the art” can be: Nazi-looted art, which could not be matched to any lawful owner, was auctioned off in the so-called “Mauerbach Auction” in 1996. Photographs of the backs of the paintings were taken before the auction. A comparison of the information found there with data from the archives – which had not yet been opened at the time of the auction – retrospectively allowed the original owners to be identified for a not inconsiderable number of these paintings. P.S. : On my personal “case”: the handover of the secured objects went without further complications thanks to the good cooperation from the local authorities; only the information on the painting of the Austrian Biedermeier painter proved to be incorrect. It was clearly the second version described in the category of works. Not only are art thefts increasingly in the public perception – Munch’s “Scream”, paintings by Picasso, van Gogh, Renoir and not least the “Saliera” – the methods of the thieves are also becoming ever bolder. New types of criminal strategy, such as “artnapping” – the extortion of ransom money for stolen art objects – are popping up and artworks are also increasingly becoming the focus of “common” gangs of thieves. It therefore comes as little surprise to learn that the majority of stolen artworks are removed from private homes, houses and villas. Here in particular, the often absent, faulty or outdated security measures are seen not only by specialist gangs, but also by opportunists, as an invitation to carry out a simple and low-risk coup. An old apartment in the city centre, a penthouse maisonette, a villa in the country: different properties are exposed to different hazards and require tailor-made solutions. Risk analysis and security concepts should remain in the domain of competent experts, because ultimately the burglar is also usually a professional in his field. It is vital to pay attention to the certification of installed security systems. In addition, it is also worthwhile involving an independent security consultant – even for the testing of existing systems – analogous to the “dual control principle”. A serious art insurer could, of course, be very helpful in this area, or even offer it as a service. Finally, I would like to make reference to the information provided by the “Criminal Investigation Consulting Service”. It must be remembered that an electronic intrusion detection system (colloquially called an ‘alarm system’) can only report a break-in, but cannot prevent it. Neither should the preventive effect be overestimated. An effective security concept must always comprise a sensible combination of mechanical security measures and electronic surveillance, which is connected to a permanently staffed monitoring centre. The classic concept of activating an alarm after unauthorised access to a secured property has essentially been superseded. It has proven much more effective to place electronic security ahead of the mechanical. An alarm signal is forwarded as soon as someone tries to gain forced access to a building or residence. Ideally, the time needed by an intruder to get past the security measures – the expert refers here to the ‘resistance time value’ – should be longer than the time needed by the alerted security forces to intervene on site – the so-called ‘intervention time’. This can be achieved with a practical combination of different mechanical measures. Important here are the choice and expert installation of security locks and the protection of door and window hinges against being prised out. In particular, the double doors found in the entrance area of many old apartments should be especially secured against being “pushed open”. Other common weak points include the tilt-and-turn fittings on windows, balcony and terrace doors. The risk of glass panes being smashed – both in old buildings and listed properties – can be relatively simply and inexpensively countered through the application of special films which – assuming the window has a sufficiently robust construction – considerably improve the resistance value. The possibilities offered by electronic security are manifold and technology in this area is advancing rapidly. Manipulations to doors and windows are identified early, unauthorised interventions in the alarm system and the transmission lines to the security force headquarters, as well as their sabotage, can and must be largely prevented. If video surveillance is accorded a central role for preventing damage and vandalism in museums, then its use in the private domain is indicated only from a high concentration of value or a sharply elevated level of risk. A combination of intrusion detection system with automatic fire alarms represents an effective addition to the security system in terms of minimising the overall risk. However, in order to rule out malfunctions, both systems must be attuned to each other. Another important point, which is unfortunately also related to personal experience, is that a good intrusion detection system can only do its job when it is actually switched on. One final important aspect of the “Security” topic should not be forgotten: objects of value and artworks must – for the worst-case scenario – be documented so as to enable unambiguous identification and thus their retrieval and safekeeping. International organisations, such as the Art Loss Register, make collected information on stolen artworks available to auction houses and art dealers, making it harder for stolen goods to be legally disposed of. Following stolen art, the next volume looks at art that has been damaged or destroyed.